Our quantitative way to highlight the best games of a busy slate. See below for the explainer. Game of Interest #1 Hartford Dartmouth1211LaxWP Game PageTension Game Score: 48★ ★ ★The tension game score for this game was 48, which indicates an extremely close nail-biter.Hartford Min. Win Probability: 6%★ ★ ★The lowest win probability that Hartford had at any point during the game was 6.6%, which means that this was a “happens-a-couple-times-a-year” type comeback.Lax-ELO Points Transfer: 17★The victory means a transfer of 17 Lax-ELO points from Dartmouth to Hartford. As a result of this transfer (and the rest of the games played), Hartford moves from 65th to 63rd nationally; Dartmouth goes from 62nd to 65th. Game of Interest #2 Cornell Syracuse813LaxWP Game PageTension Game Score: 132★The tension game score for this game was 132, which means that it was not a very tight affair for the most part.Syracuse Min. Win Probability: 40%★The lowest win probability that Syracuse had at any point during the game was 40.1%, which means that while things never get truly dire, this was an uphill battle.Lax-ELO Points Transfer: 24★The victory means a transfer of 24 Lax-ELO points from Cornell to Syracuse. As a result of this transfer (and the rest of the games played), Cornell moves from 6th to 6th nationally; Syracuse goes from 15th to 15th. Game of Interest #3 Georgetown Loyola MD1416LaxWP Game PageTension Game Score: 123★The tension game score for this game was 123, which means that it was not a very tight affair for the most part.Loyola Min. Win Probability: 44%★The lowest win probability that Loyola had at any point during the game was 44.5%, which means that while things never get truly dire, this was an uphill battle.Lax-ELO Points Transfer: 6★The victory means a transfer of 6 Lax-ELO points from Georgetown to Loyola. As a result of this transfer (and the rest of the games played), Georgetown moves from 8th to 8th nationally; Loyola MD goes from 4th to 4th. Game of Interest #4 Canisius St. Bonaventure168Tension Game Score: 148★The tension game score for this game was 148, which means that it was not a very tight affair for the most part.Canisius Min. Win Probability: 70%★The lowest win probability that Canisius had at any point during the game was 70.6%, which tells us that the eventual victory was never really in doubt.Lax-ELO Points Transfer: 50★ ★ ★The victory means a transfer of 50 Lax-ELO points from St. Bonaventure to Canisius. As a result of this transfer (and the rest of the games played), Canisius moves from 40th to 32nd nationally; St. Bonaventure goes from 60th to 65th. Game of Interest #5 Siena Princeton1019LaxWP Game PageTension Game Score: 140★The tension game score for this game was 140, which means that it was not a very tight affair for the most part.Princeton Min. Win Probability: 54%★The lowest win probability that Princeton had at any point during the game was 54.2%, which tells us that the eventual victory was never really in doubt.Lax-ELO Points Transfer: 8★The victory means a transfer of 8 Lax-ELO points from Siena to Princeton. As a result of this transfer (and the rest of the games played), Siena moves from 57th to 58th nationally; Princeton goes from 30th to 27th. When we are blessed with a day in which the slate of games numbers in the dozens, it is all but impossible to really keep track of all the goings on in D1 lacrosse. So we decided to put out a daily digest of the day that was. The idea here is to use some metrics that we can calculate for each game as a way to highlight the most meaningful or interesting matchups. Tension Game Score – a measure of how tight the game was. A back-and-forth match up where neither team is able to take control is going to have a lower tension score (i.e. smaller gap between the teams). Min. Win Probability – the lowest win probability value that our model ascribed to the eventual winner during the course of the game. A game where the winner had to make a huge comeback is probably going to have a very low win probability (think about the moment that it seemed least likely that they’d come back). Lax-ELO Transfer – a measure of how much an intridual game did to make us re-assess how good a certain team was. In a game where a favorite beats the underdog by as much as we thought they would, you don’t really update your priors about how good each team is. Those games would also transfer a relatively small number of Lax-ELO points. We will present the metrics for each game, along with a star-based indicator to tell you how common or uncommon that outcome is. For example, a game in which the winning team had a win probability in the single digits is a rare occurence and would get 3 stars in that category. 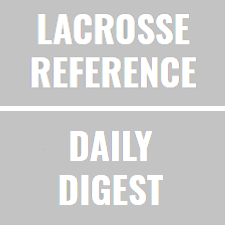 We welcome your feedback, and we hope that this helps you to distill down the craziness of a full lacrosse slate into a more digestible list of highlights.